The Brain That Changes Itself: Stories of Personal Triumph from the Frontiers of Brain Science - Jon Lieff, M.D. One of the most important discoveries of the past generation of neuroscientists is the widespread and rapid change that occurs in the brain from childhood through old age. While new cells in adults are limited to only certain parts of the brain, all neurons are constantly building, changing and rebuilding connections to other neurons. This process includes daily pruning and creation of dendrites, almost instant increase and decrease of the receptor sites in the membrane, and constant changes in the rates of firing of neurons. The fact of neuroplasticity was resisted for many years but now is clearly known to be correct. Whatever is referred to as mental power, that is, thought, attention, learning, or mindfulness, changes the brain by constantly stimulating, strengthening and tearing down circuits. 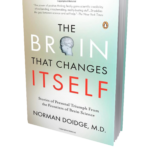 This book takes these changes seriously and describes many scientific approaches to the clinical use of neuroplasticity. The limits of the power of the mind to change the brain are unknown, but this book is an excellent start.